GiveDirectly's standard transfer schedule involves two transfers.3 GiveDirectly participated in a study of behavioral interventions that allowed some recipients the ability to choose when they receive their transfers (see row 5 of this spreadsheet). Rwanda benchmarking project: In 2015, GiveDirectly finalized an agreement for a partnership project in Rwanda. GiveDirectly will be implementing cash transfers in two randomized controlled trials; the studies will cost &dollar;4 million and are co-funded by an institutional funder and Google.org.42 The studies will test cash transfers as a benchmark against other aid programs funded by the institutional funder.43 GiveDirectly started enrollment for one of the studies in 2016, for which it expects results in late 2017, and as of August 2016 was finalizing the structure of the second study.44 GiveDirectly has provided us with some additional details about the studies, which are not yet public. In mid-2014, three members of GiveDirectly's board of directors began the for-profit technology company Segovia, which develops software that NGOs and developing-country governments can use to help implement their cash transfer programs.59 Paul Niehaus and Michael Faye, co-founders of GiveDirectly and Segovia, split their time between the two organizations.60 They previously told us that they track their time allocation to projects and would be able to share details of how much time they each spend on GiveDirectly and Segovia; however, when we requested this information, GiveDirectly told us that it had previously understood that we no longer wanted this information so it had stopped explicitly time tracking. This was a miscommunication, but we decided not to ask GiveDirectly to track this going forward. GiveDirectly estimates that the time Faye and Niehaus collectively spend on both organizations amounts to each organization having the equivalent of a full-time CEO.61 One other staff member who was previously working full-time at GiveDirectly now works part-time for each entity.62 We discuss potential risks from the overlap in staff in this blog post. 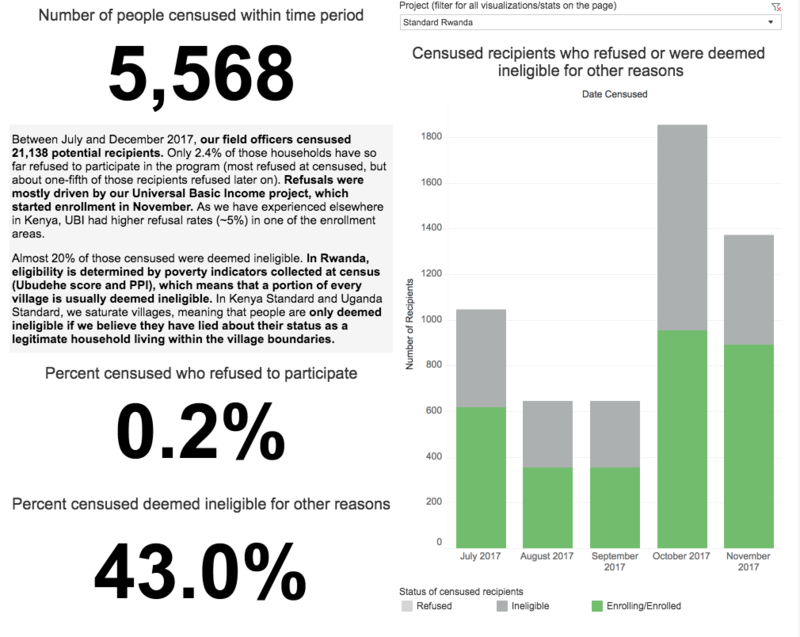 For several of GiveDirectly's past campaigns, GiveDirectly staff surveyed recipients on how they used their cash transfers during the follow-up calls.74 The surveys were conducted at different points in the transfer cycle of each campaign.75 We summarize the data from the more recent campaigns in Kenya and Uganda below. The spending data from Kenya covers portions of the Kenya 2M, Kenya 1.2M, and Kenya rolling campaigns, and covers dates from February 2014 to September 2015. The spending data from Uganda covers some of the Uganda pilot campaign from October 2013 to April 2014.76 Note that we do not put much weight on this data, as it is all self-reported and we have no control group to compare it to. We have limited information on the cost-effectiveness of GiveDirectly's basic income guarantee program. While we have modeled the basic income guarantee program in our cost-effectiveness analysis, we do not have a high degree of confidence in our results. Our model indicates that GiveDirectly's standard cash transfer campaigns are roughly 1.5 to 2 times more cost-effective than the basic income guarantee program.91 The difference in cost-effectiveness is partially driven by the fact that GiveDirectly is raising funding for the basic income guarantee study upfront and investing it in a low-risk portfolio. On average, because one arm of the study will receive cash transfers for 12 years, this funding won't be spent for multiple years, so the benefits from the funding are discounted. As we have mentioned above, it is our impression that GiveDirectly has increased its focus on experimentation and partnerships. We expect the structure of benchmarking cash transfer programs could look substantially different from GiveDirectly's standard model in some cases. For example, GiveDirectly has told us that if it is benchmarking cash against a program that distributes food stamps, GiveDirectly might disburse smaller and more frequent payments (which recipients are more likely to spend on food) to make the programs more comparable.94 As with the basic income guarantee program, and for similar reasons, benchmarking projects could be more or less cost-effective than GiveDirectly's standard program. "While the results of this project will be applicable in many places, Rwanda is an ideal setting in which to conduct it. Rwanda features a) a burgeoning mobile money landscape, with 17% mobile money penetration in mid-2013 as per National Bank of Rwanda and cell phone penetration at 72% in September 2014, b) a sizeable population of poor households (45% below the poverty line), and c) a track record of prioritizing transparent and innovative aid programming." 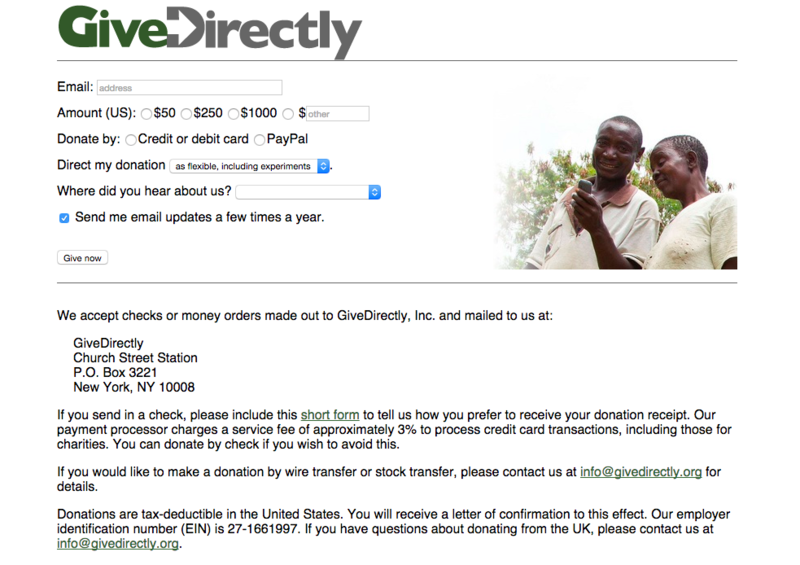 @GiveDirectly, Rwanda technical application@ Pg 5. Kenya: In Kenya, registration involves giving the household member a SIM card (if they do not already have an M-PESA account), which is used to transfer funds through the M-PESA system, and collecting other data that can be checked against the initial data from the census. Recipients are also given the option of purchasing a cell phone from GiveDirectly at the time of registration, the cost of which is removed from the recipient's transfer (@Conversation with Paul Niehaus, President, and Michael Faye, Director, GiveDirectly, October 6, 2012@). "GiveDirectly gave cash transfer recipients the option of spending some of the money that they receive to buy a phone provided by GiveDirectly." @Conversation with Paul Niehaus, President, and Michael Faye, Director, GiveDirectly, October 6, 2012@, pg. 3. [GiveWell]: What is GiveDirectly checking to determine the quality of the campaigns with removed steps (especially the Kenya campaign with no backcheck and token payment)? "Recipient Comprehension: With the removal of back check, we are tracking any deviation in recipient comprehension below 90% (our preferred rate). We are tracking this through additional survey questions in both audit and our follow up surveys where we ask recipients their understanding of our program. Additionally, Associate Field Managers will be conducting quality check surveys at audit stage for another data point on recipient comprehension. "Back-checking. Another enumerator, distinct from the census and enrollment workers, revisits each enrolled household to check that they eligible [sic], didn’t have to pay a bribe to enroll, etc." GiveDirectly, Operational process overview, Pg 3. In Uganda, the field staff who have done audits in past campaigns were from earlier enrollment teams. @Conversation with GiveDirectly field staff, October 20-21, 2014@ (Note that this point was not included in the notes from this conversation). In early transfer campaigns, GiveDirectly transferred a first, full installment to recipients before its first call; in its Google campaign, GiveDirectly implemented the initial small transfer to enable it to identify problems before transferring the larger amount. @Piali Mukhopadhyay, COO, International, GiveDirectly, conversation with GiveWell, November 7, 2012@. "These figures are high relative to participation rates in typical development programming, which is not surprising given the unconditional nature of our transfers. For example, Manuela Angelucci and Orazio Attanasio found that Oportunidades, a conditional cash transfer program in Mexico, had take up rates of roughly 50%. Oriana Bandiera et al. report that a BRAC training program targeted at adolescent girls in Uganda expected participation rates of roughly 20%. "Recently, however, we’ve seen lower than usual participation rates in parts of Kenya. In July 2015 we entered Homa Bay, a new county and our first venture outside of Siaya. In Homa Bay and the neighboring areas, roughly 45% of the households we speak with decline to be enrolled into the program. As it turns out these challenges have been common for NGOs working in the area. Other development programs focused on HIV, water and sanitation, agricultural development, education, and female empowerment have also faced community resistance." 77. In follow up surveys administered in Uganda, recipients were asked about spending on large household items and small household items. The figure reported here is the combination of those two categories. 83. In the Uganda follow up data, this issue is denoted "stole_item." 84. In the Uganda follow up data, we identified 4 issues that we believe all asked about bribes ("bribe," "pay to collect," "others_bribes," "agent_bribe"). We only include the "bribe" issue in this table for Uganda (which has the highest rate of complaints out of the four). 89. Includes Core Operations and Core Operations-general. Excludes fundraising. Note that GiveDirectly has told us that recipients in Homa Bay have a slightly lower average daily consumption of &dollar;0.50. @GiveDirectly, Consumption data for targeting work@ So, the calculation in Homa Bay would be (365*&dollar;0.50)=&dollar;182.50. (&dollar;288/&dollar;182.50)=158%. @Conversation with GiveDirectly field staff, October 20-21, 2014@, Pgs 5-6.